Anker's Zolo Liberty+ wireless in-ears raise over $650,000 in 24 hours | What Hi-Fi? These wireless Bluetooth 5.0 in-ear headphones will support all major digital voice assistants, and are set to ship in August. Many companies are trying to crack the wireless, in-ear headphones market. Apple's AirPods are probably the best known versions, but there are numerous alternatives available, not forgetting the competition from 'neckbuds'-style headphones, such as the Bose SoundSport Wireless. Smartphone accessory manufacturer Anker is the latest to enter the market and, judging by the response to a Kickstarter project for its Zolo Liberty+ headphones, the company may be on the right track. The project has currently raised $681,939, easily surpassing its $50,000 goal in just one day. 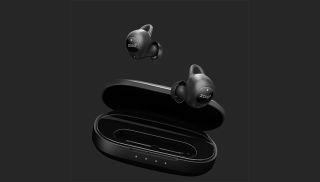 The Zolo range is part of Anker's new smart audio brand, which aims to beat competitors in four main areas - sound quality, comfort, Bluetooth connection and battery life. The last one is particularly important for Anker, which has made its name through its smartphone battery packs. The Liberty+ in-ears have 3.5 hours of standalone battery, but its casing has a 48-hour battery life and can be charged via Micro USB. Anker has streamlined the Bluetooth 5.0 pairing process down to one single button push, and the headphones will automatically pair with your smartphone once taken out of the case - making them a clear challenger to Apple's W1 chip. The Zolo Liberty+ headphones will also support all four major digital voice assistants: Apple’s Siri, Amazon’s Alexa, Google Assistant and Microsoft’s Cortana. With many in-ear wireless headphones falling down on audio quality - Motorola's Verve Ones+ and Elyxr's Air both had lacklustre sound - Anker believes its 6mm graphene drivers give these in-ears a superior performance. We look forward to putting them through their paces. Anker hopes the headphones will be ready for shipping by November, and you can still support it for $100 (£80). However, as with all Kickstarter projects, it's worth proceeding with a bit of caution.